This week, a packed house attended the screening of the new documentary, Wonder: The Lives of Anna & Harlan Hubbard at the Kentucky Theater, and I was fortunate enough to be among them. The Hubbards are darlings of Kentucky literature and forerunners of the back-to-the-land movement. Anna and Harlan embodied sustainable before the word developed into the buzzword it is today. Anna & Harlan were quiet radicals. 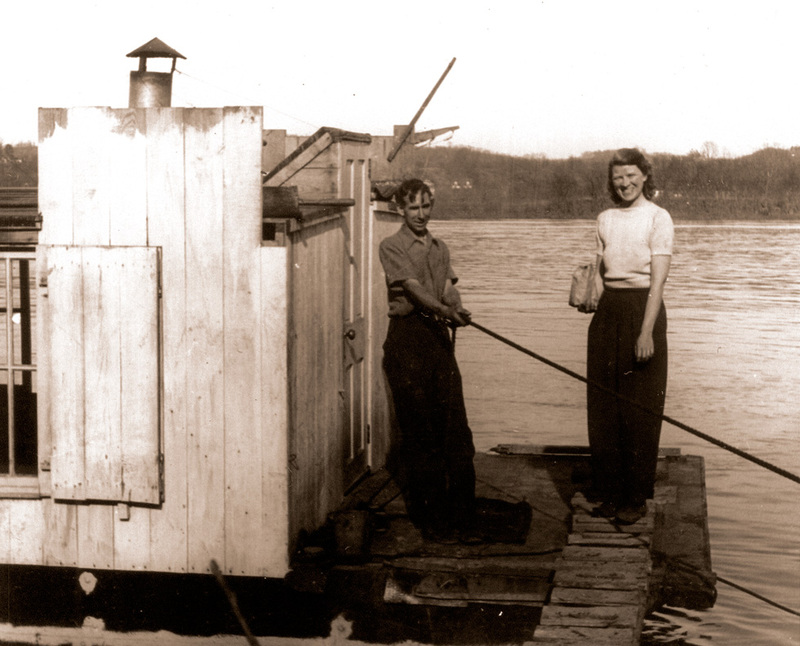 In the mid-1940s, they lived for years on a shanty boat on the Ohio and Mississippi rivers, floating downstream (they never used a motor) with their dog and beehive. They passed the time playing music and making art and being in love, both with each other and the natural world. Eventually, they settled down in their own little hand-built, off-grid cabin on seven acres. (Yes, their story shares some remarkable similarities to our modern day friends Hannah and Jesse at Rough Draft Farmstead.) There, they lived and worked and entertained the steady stream of visitors who came to see and learn about their alternative lifestyle. I think what is most striking about Anna and Harlan is that they did not really live as they did to make a statement, but simply because there was no other way for them to live and be happy. They loved their simple life, and I think that is why it was so successful for them. You can’t choose such a radical lifestyle out of some sort of misguided sense of duty or obligation, because it almost always results in burnout and failure to abide by one own’s ideals. While Harlan’s books probably already grace the bookshelves of anyone concerned with Kentucky literature, I am glad that this excellent documentary produced by Morgan Atkinson will make their lives more accessible to a new generation. It’s incredibly well done, narrated by Wendell Berry and accompanied musically by the always-talented Ben Sollee. The film was funded in part by a Kickstarter campaign, and it is fortunate that so many folks were willing to support such important work. Don’t be mistaken—the Hubbard’s story is a dangerous one. My own father, who has always felt the pull of a simpler life, was fully ready to quit his job and take to the river after his first reading of Harlan’s Shanty Boat, and I think those of us who share the particular affliction of loving the land and hating commerce and corporation will have the same reaction to Wonder. In short, I want to be the Hubbards when I grow up. It’s hard not to yearn for a life of raising your own food, creating art and music, and avoiding the daily grind of a “real” job and the American sensibilities about what we must have to survive. To read and watch about a couple that did just that is stirring. Take note: it’s also easy to gloss over the sheer volume of work, toil, and stress involved in such a life when you are watching it glorified on the big screen! This screening was sponsored by the Idea Festival. There was also a beautiful assortment of Harlan’s art on display, and a great talk afterwards with the producer and several others moderated by the Herald Leader’s Tom Eblen. All in all, it was a great night. I can’t recommend enough that you make room in your schedule to view this beautiful film and to read more about the Hubbards. Connect with the film Wonder on Facebook. A great piece by Tom Eblen about the film and the Hubbards. Buy the film Wonder on Amazon. View some of his art in the book, Woodcuts of Harlan Hubbard. Even Wendell Berry chronicled their lives in his book, Harlan Hubbard: Life and Work. There is also a book about Anna, Anna Hubbard: Out of the Shadows by Mia Cunningham.